Backed by three decades of water conservation measures, semi-arid Saurashtra is driving Gujarat’s agricultural growth. Will it be able to sustain it? Praveen Makwana, a farmer in Mespur village in Gujarat, is preparing his field for two cash crops, cumin and cotton. The state government has declared Mespur and 4,000 other villages in Saurashtra drought-hit after the monsoon ditched the semi-arid region last year. But Makwana is unfazed by the declaration. “Drought is a thing of past,” he says, pointing to a truck picking up cotton bales from his neighbour’s field. The joy of reaping a good harvest amid drought is not limited to Mespur. Hundreds of villages across Saurashtra are sailing through drought with little impact on agriculture. Prafulla Faldu, trustee of non-profit Saurashtra Jaldhara Trust, says unlike droughts of the 1990s, water scarcity this time is mostly felt in urban areas. What’s more, the region that was once known for its partially desert topography and severe droughts, now drives the state’s agricultural growth of 9.6 per cent. Analysts say three decades of community-led and government-supported water conservation work has brought about this turnaround. In addition, normal monsoon during the last decade ensured that the efforts did not go waste. The prevailing drought condition, which has hit the region after nearly a decade, puts the water conservation movement to test. The movement began in 1987 with communities and organisations building thousands of water conservation structures, such as check dams and percolation tanks, to combat drought. The state government adopted this and expanded the movement into a participatory programme called Sardar Patel Sahakari Jal Sanchaya Yojana in 2000. The programme focused on the state’s arid Saurashtra, Kachchh, Ahmedabad and Sabarkantha regions. The programme achieved a remarkable success in Saurashtra. Official statistics show 38 per cent of the 70,719 check dams built across the state till March 2012 are in the Saurashtra region. Now there is an increase in groundwater level, leading to a boom in agriculture in the region. Girdhar Satasia, a farmer in Boria village of Rajkot, says groundwater level was 182 metres below the ground in 2001; now it is at 6 metres. “We grow three crops a year. Over 800 farm workers from textile town of Jetpur and faraway central Gujarat work in our fields,” says Patel. Ek ka teen, literally three for one, is a concept that sounds suspicious in the first place. But this concept has ushered in an era of agricultural growth in Saurashtra, where farmers no longer worry about droughts. “The government builds a check dam for Rs 3,200. We build three at the same price,” says Premji Patel of Vruksha Premseva Trust, pioneer in water conservation movement in the region. The government factors the cost of tendering into the cost of check dams. This escalates the price, he adds. It is because of this ek ka teen concept and involvement of communities that Saurashtra today boasts 27,000 check dams. The benefit was evident within the first year of building check dams. Girdhar Satasia, a farmer from Boria village in Rajkot, says his profit has gone up by 300 per cent since the trust helped them build seven check dams in 2000 on a rivulet, the Foffar, passing through his village. With assured irrigation, Satasia and other farmers in Boria have taken to growing cumin, a cash crop, along with traditional crops like groundnut. “A kilogram of cumin fetches up to Rs 2,500 in the local market,” says Satasia. Every household in Boria also harvests rainwater for round-the-clock drinking water supply. They also collect wastewater in tanks, paved with sand and clay. The filtered water is then reused for irrigation. Panchayats in several other villages encourage farmers to grow less water-intensive crops such as onion, garlic and cumin. In Mespur, sarpanch Hardevsinh Jadeja says residents have innovated a water conservation method, field pond. For this, they select a field with sloppy terrain. Rainwater is collected by constructing a high-barrier wall at the end the slope. Underground pipes are used to drain excess water from the field. 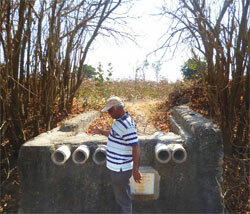 This acts as a check dam and recharges aquifers while providing water for cultivation, Jadeja adds. Octogenarian Premji Patel, founder of Vruksha Prem Seva Trust (VPST) and leader of the movement, says none of the villages covered under the movement are experiencing drought-like condition. “Water in check dams would last till the next monsoon, even as water scarcity seems to affect the whole region.” In Mespur, where check dams were built in 2002, wells hold water at two to three metres, and check dams are filled to one-fourth of their capacity. This could not have been achieved without community efforts. Says R Parthasarathy, faculty and researcher of the Centre for Environment Planning and Technology, Ahmedabad, most water conservation structures in the region were constructed on private land instead of public or government-owned land like forest areas. Aided by government funds and non-profits that helped in capacity building, the enterprising Gujarati farmers took it upon themselves to maintain these structures, Parthasarathy adds. According to a study by the Central Ground Water Board (CGWB), Gujarat is the only state in the country where groundwater balance has turned positive in recent years, and this is primarily due to rising groundwater levels in Saurashtra. In 2001, groundwater levels recorded a decline across 27,600 sq km in Gujarat. The decline was limited to just 4,400 sq km in 2006. The trend reversal was mostly reported in Saurashtra and parts of northern Gujarat that account for a large chunk of water conservation works. According to CGWB, check dams and percolation tanks built across the state during 2000-2005 have been recharging the aquifers with 480 million cubic metres a year, the highest of all regions and by all sources in the state (see ‘Water wise’). 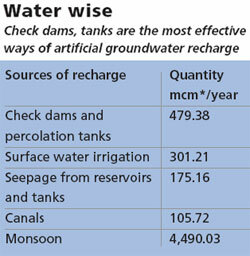 “Rainwater harvesting and artificial groundwater recharge on such a large-scale in Saurashtra and Kachchh has prolonged the period of recharging aquifers during the post-monsoon season, stabilising groundwater levels and even reversing the trend of groundwater depletion,” says R C Jain of CGWB. The check dams built in the past decades have added to the agricultural growth in the area,” says Tushaar Shah, director of the International Water Management Institute (IWMI), Anand. 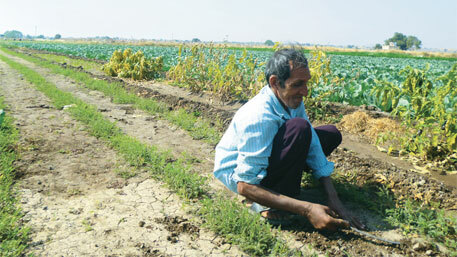 A research paper of IWMI shows Gujarat reported eight per cent decline in agricultural coverage area during the 1990s. But since 2000 200,000 hectares has been converted into agricultural land every year. “This has also ushered a dairy movement in Saurashtra, benefitting the residents,” Shah adds. In 1991-92, Saurashtra and Kachchh had a 31 per cent share in Gujarat’s net value of selected crops and milk. This share, after some fluctuations, has steadily soared post-2000 to 49 per cent in 2007-08, says IWMI report. The success story of Saurashtra may not last long. With rising availability of water, farmers have shifted to cash crops. This has led to increased groundwater use. Official records show many cotton and wheat farmers stare at huge losses this season. Crops that have survived mostly belong to rich farmers who own pumps to extract groundwater. The drought also brings into focus an election promise made in 2001 of taking the Narmada water to Saurashtra and as far as Kachchh. Though a few villages in these regions receive drinking water from the Narmada, water is still not available for irrigation. Canal network in this arid zone is far from complete. Besides, Patel says, Saurashtra is on an higher elevation and it will be impossible for the state to bring the canal network to this region. During the 2009 general elections, Saurashtra farmers had staged rallies, demanding Narmada water for irrigation. This had swayed the election results against the BJP then in power in the state. With the general elections a year away, this time, the state’s political will shall be put to test.